Clients, it turns out, want to see how the efforts they’re paying for are working. We show clients lots of reports that indicate the success of their SEO campaigns, and KPIs are slightly different for every client depending on what kind of a site they have, what their goals are, etc. 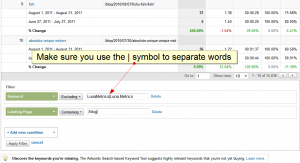 However, there are three univeral SEO Key performance indicators that we use for everyone. Rankings: A lot of clients come to us obsessing about rankings and to tell you the truth, we’re obsessed about rankings too. But it’s impossible, simply impossible, to use a 3rd party tool to figure out every single derivation of a short-tail key phrase that might possibly rank. 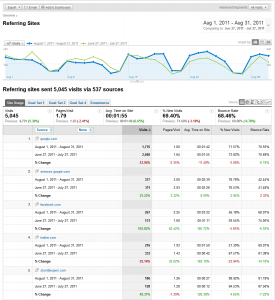 Sure we track a select list of short tail key phrases in order to provide a barometer for the campaign, but the only purpose for getting higher rankings is to increase quality traffic to the website which brings us back to our main KPI. Links: As we all know, increasing inbound links plays a huge role in getting a site ranked higher. Therefore, another SEO key performance indicator for us is the quantity of inbound links we generate. There are lots of external tools you can use to track these links like Majestic SEO and Open Site Explorer, but you can use Google Analytics to keep tabs on them too, assuming you build quality links that get traffic as well as raise rankings. 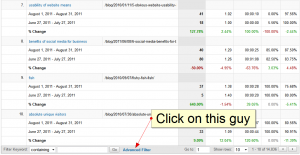 This is usually ridiculously easy to track through Google Analytics if you use the old interface. If you use the NEW interface, the score card no longer shows comparisons with past data, only comparisons to the site average, which, in my opinion, is super, super lame. You just use Advanced segments to filter out everything but non-paid organic search traffic and run a keywords report and filter out the brand name. Easy right? Well, what if you’re only responsible for optimizing a certain section of a site. For instance: For internal political reasons, one of our larger clients has a lot of editorial leeway on a specific section of their site where they can make all the on-page optimization changes (titles, metas, copy and headers) changes that we ask for. Under Traffic Sources, choose Keywords. Make sure you click the “non-paid” link to make sure you’re filtering out any paid search. We don’t want to take paid search into consideration while we try to judge the efficacy of organic search efforts. Using the advanced filter, filter out branded keywords and the landing pages that are in the section you’re considering. Enjoy your report which shows how many people landed on the page in the section you are concerned with through organic search and which keywords they found that page with. 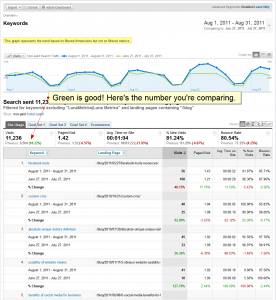 Both the number of visits and the quantity of keywords should go up month over month. 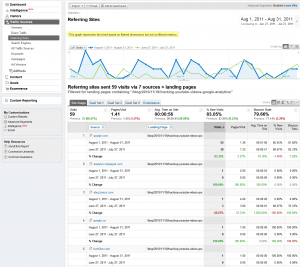 We use the Referral report as one way to track inbound links from other sites. Get it? Cause the linking sites refer traffic? There are a couple ways to use the referral traffic data. If you’re keeping a list of sites that from which you’re pursuing links, you can simply filter the referrals page for those sites and see if you’ve started getting any traffic from them. Even one visit means someone came from a link on that site. If you’ve got a strong link-bait campaign going, you can track progress on that by choosing the secondary dimension “landing page” and then filtering for the page that you wrote as link bait. Hopefully, this has given you some good insights into how to judge the efficacy of your SEO campaign using nice, free, easy-to-use Google Analytics. Happy Analysis! What KPI’s are you using to measure your success? Let us know in the comments section!